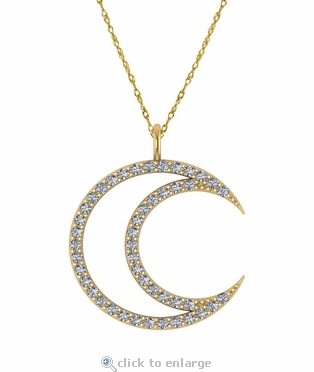 The Lunar Crescent Moon Prong Set Cubic Zirconia Pendant is a beautifully designed outline of a lunar crescent moon. The crescent is a curved shape that is thicker in the middle and tapers to thin points at each end. 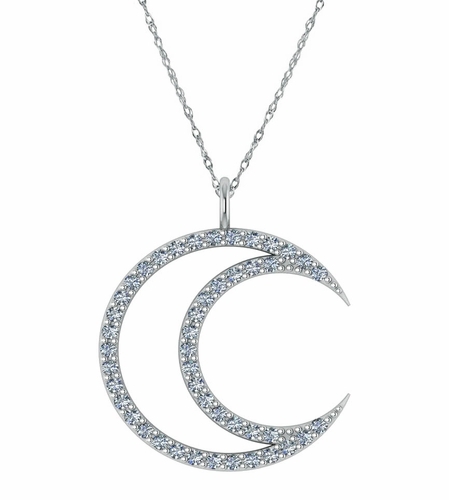 The cubic zirconia simulated diamonds are prong set outlining the lunar crescent moon pendant, measuring approximately just over 3/4th of an inch in length. 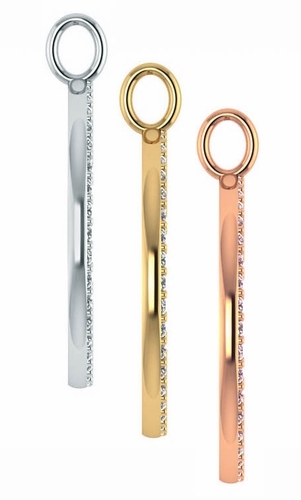 This lunar crescent moon pendant is offered in 14k white gold, 14k yellow gold and 14k rose gold. Choose from a standard 16 inch chain length or upgrade to a 18 inch chain length, please see the pull down menu for options. Each pendant sold separately. For further assistance, please call us directly at 1-866-942-6663 or visit us via live chat and speak with a knowledgeable representative.